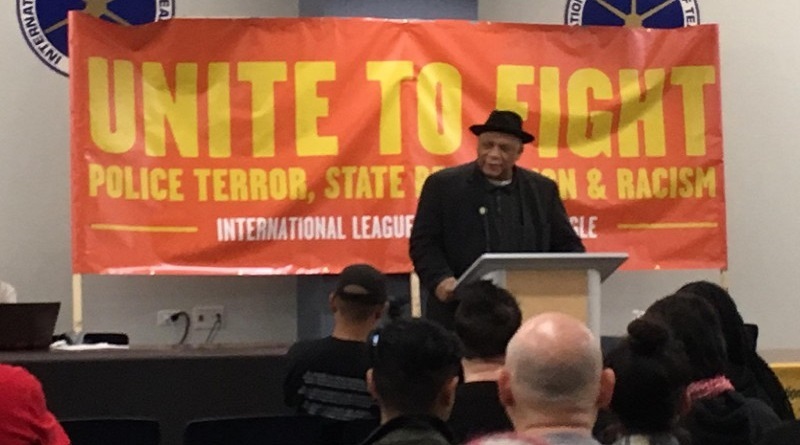 As chairperson of the the International League of Peoples’ Struggle (ILPS), I am deeply pleased to extend this message of solidarity to the conference being held today in Chicago entitled “Right to Resist, Right to Exist: Unite to Fight Police Terror, State Repression, and Racism”. Organized by the ILPS-USA to mark the two-year anniversary of Laquan McDonald’s murder by a Chicago police officer, the conference focuses on the ongoing people’s struggle in Chicago against state repression, national oppression, and neoliberal attacks on the people. It is excellent that in holding this conference, the ILPS-USA aims to gather grassroots activists, allies, and concerned peoples to dialogue, share strategies, and raise the national discourse around police brutality, racism, and politically-motivated repression to link these issues to the impacts of US foreign policy, its wars of aggression and miitary interventions abroad. Chicago has a long history of working-class militancy, with the 1886 Haymarket labor demonstration and the ensuing massacre and state executions now recognized by the world as the origins of International Workers’ Day. The city was also a major center of the early 1960s civil rights movement and the 1968 anti-war protests all the way to the 1970s. Its activist organizations kept the fires of people’s resistance burning throughout the neoliberal era until now. Advanced industrialized nations, such as the US and Canada, continue to reel from the crisis of neoliberalism that rose to prominence since the 2007-2008 financial meltdown and the ensuing Great Recession. The rapid growth of privatization of public resources, financialization, liberalization, deregulation and imperialist globalization from the late 1970s onwards, instead of perfecting monopoly capitalism, are instead aggravating all of its contradictions. The result is worsening underdevelopment of most countries, the spread of poverty and social inequalities. With the labor market deregulated since the 1980s, the exploitation of the US working class has become most flagrant at the lowest rungs of the labor ladder, where most women, youth, blacks and immigrants find themselves. The federal government boasts that US jobs grew from 2011 to 2016. However, it has taken longer and longer for the job growth rates to recover from one recession to the next. Also, the net job creation in the past 10 years was in alternative work arrangements such as contract, temporary help, on-call, independent contractors, or freelancers—which generally pay lower wages and do not include health and pension benefits. The low unemployment rate (5.0% as of November 2015) merely hides the fact of the growing numbers of workers (many of them blacks and Hispanics) who are discouraged from looking for work or who are no longer counted as part of the labor force. The youth unemployment rate is much higher at 15.7%. The ratio of unionized wage and salary workers in the US declined from 24% in 1973 to 11.1% in 2015. As a result, by 2015, the median weekly earnings of non-union fulltime wage and salary workers were generally lower by USD 200 compared to their unionized counterparts. Even among unionized workers, the median weekly earnings of women stood at USD 928—lower than those of men at USD 1,017. The earnings of blacks (both men and women) stood even lower at USD 800. The number of officially poor people in the US has increased from 38.05 million in 2007 to 48.81 million in 2013, with current poverty rates hovering just below 16%. At the same time, income inequalities have worsened: the highest quintile (20%) of US households had controlled 43.3% of the total wealth in 1970. It increased to 49.8% in 2000, and to 51.1% by 2015. In comparison, the lowest quintile earned only 4.1% in 1970, 3.6% in 2000, and 3.1% in 2015. Social inequalities are also evident in residential segregation, which has gotten worse from decade to decade. The US federal government claims that it has pushed down the overall rate of homelessness. But the housing crisis remains a big problem. The number of poor renter households with severe housing cost burden increased from 5.13 million in 2007 to 6.42 million in 2013, while the number of poor people who were doubling up with family and friends jumped from 4.61 million to 7.69 million in the same period. High school dropout rates have risen and college enrollment rates have fallen across all categories, but are especially worse among blacks and Latinos. Such worsening exploitation, poverty, inequalities, and homelessness forms the backdrop of worsening state repression, police terrorism, and fascist impunity, which in turn are making the face of neoliberalism more loathsome to the masses. The systematic deprivation of social resources, especially to working-class, black and immigrant communities, lead to the proliferation of ghetto-like conditions in many US cities. Police forces automatically assume criminal intent when they see any gesture of resistance in neighborhoods and on the streets. Criminalization of all kinds of citizen behavior, militarization of police equipment and procedure, and lack of strict accountability are resulting in extreme police actions such as raids on homes, routine stop-and-frisk, physical abuse of suspects, and arbitrary shootings, resulting in injuries, deaths, and cover-ups. According to a study by The Guardian, US law enforcement officers killed a total of 1,134 Americans in 2015. Non-white Americans (black, Latino, Native, and Asia-Pacific) make up less than 38% of the US population, yet they comprise almost half (47.2%) of all the people—and more than half (53.6%) of all unarmed people—killed by police. The situation is worst among young black men: despite making up only 2% of the total US population, black males between 15 and 34 comprised more than 15% of all police killings. Of all black people killed by US police in 2015, nearly 70% were non-violent or unarmed. The US incarceration rate has grown dramatically since the 1970s, and is now one of the highest rates in the world. Based on a 2008 study, among young black males who are high school dropouts, a full 37% are in prison or jail. The current US presidential campaign, foreign policy debacles, and military adventures abroad further underscore the gravity and irreconcilability of the basic contradictions of monopoly capitalism, which have been aggravated by the current crisis of neoliberalism. On the one hand, the imperialists are using the presidential campaign and narrowly defined election issues to divide the US working class and oppressed peoples, agitate them to fight each other, and gloss over the fundamental issues of monopoly capitalist exploitation and oppression, which drive police terror, state repression, and racism. If the whole range of domestic and global issues are handled correctly, however, they can teach the US working people, including women, youth, blacks, immigrants, the homeless, and impoverished veterans, to understand in a deepgoing way how domestic issues are tightly intertwined with global issues. That all these issues revolve around the dominance and decadence of US imperialism underscores the urgent need for the US working people to build an anti-imperialist united front in the very belly of the beast and direct their struggles against this monster. We must transcend the neoliberal, neoconservative and neofascist attacks by forging unity. We must, more strongly than ever, assert the people’s right to fight monopoly capitalist exploitation and state repression. The International League of Peoples’ Struggle (ILPS) represents what is currently the largest international anti-imperialist formation in terms of membership. It is offering to contribute to the effort to build such a united front in the US itself. The US chapter of the ILPS, established in 2012, is ready to reach out to all interested organizations representing various sectors of the American people. This conference—the first major activity of ILPS US since 2012—seeks for such a united front to achieve solidarity, strength and greater successes through mass struggles in these times of worsening social crisis, severe state terrorism, and intensifying struggles. The periodic political contests between two or more factions of the monopoly big bourgeoisie, even if they appear to address some of the people’s real issues, will never bring about fundamental social changes. The working people of the US must continue to organize, mobilize, and rely on themselves to create this change. In forging a strong and united anti-imperialist mass movement, the US people and their organizations can reach out even further and link with other oppressed peoples around the world who are also fighting US imperialism.